Recently, I had downloaded an iPod application about different toxins or pollutants found in my neighborhood. Curious as I was, I was shocked to see that there are 63 pollutant sources, ranging from Air to Water to Ground and Radio Waves in my neighborhood! Wow! All of these affect us one way or another. We either eat or drink pollutants, breathe them in, or absorb them through our skin. With so many different pollutants and especially with the recent natural disasters and the radioactive scare in Japan, it is easy to understand why we are leaning more and more toward purchasing organic products. However, do we apply the same wisdom to our skin care products? Not so much. Commercially available skin care includes many ingredients that are borderline harmful. While some of the ingredients listed may not be harmful in a single application, using the product over a longer period of time may then be a different story. In order to understand why it is so important to use organic products not only for the foods we eat but also for our skin care, it is important to know how our skin works and functions. Our skin is the largest organ of our body. 8 pounds (3.6 kilograms) and 22 square feet (2 square meters) cover an adult body. Our skin is elastic and flexible yet tough enough to withstand environmental influences. It is protecting our body from germs, viruses, from cold or heat, from damaging sun light, or harmful chemicals. We are "wearing" our skin our entire life. Not only is the skin guarding our body and our organs, it also is constantly repairing and renewing itself. Our skin has 3 important layers: the epidermis, the dermis, and a subcutaneous layer. The epidermis is the so-called "waterproof" (misleading term!) and protective layer (physical barrier to chemicals and pathogens including viruses, bacteria or fungi). The cells that form the epidermis are called keratinocytes , which are made from Keratin, a tough protein which is also found in hair and nails. Keratin reduces moisture loss thus maintaining skin hydration. The epidermis has several layers of keratinocytes. These layers grow outward with the exterior (top) layer of the cells ( epithelial cells ) dying and shedding off. The stratum corneum is a horny layer of dead skin cells and varies in its thickness; thin around the eye and a lot thicker on the bottom of our feet. The dermis , lying underneath, is connected to the epidermis. 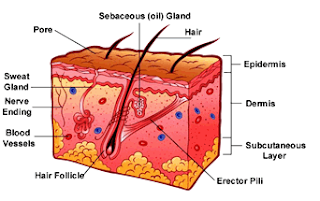 The dermis has several functions: a) it provides support and cushioning to the body via the subcutis (the base layer of the dermis which holds fat reserves in case of fuel shortage); b) fibers of collagen and elastin found in the dermis gives the skin (the organ) its strengths and elasticity; c) body temperature is regulated through increasing blood flow to the skin which allows the heat to escape or by restricting flow to keep the body heat inside; d) nerve receptors send messages to the brain when they pick up feelings such as touch, temperature, and/or pain. Hair follicles and glands with ducts pass through the skin are part of the dermis. And while I wrote that the outermost layer of the skin is "waterproof", water and other liquids as well as toxins are absorbed through the skin. How is this possible? Remember the terms osmosis and selective permeability of membranes from your Biology 101 class? Have you ever taken a long bath or shower and wondered why your fingertips or your hands shriveled up? The outermost layer of the epidermis is exposed to prolonged immersion of water which allows water to penetrate (permeate) into the epidermis. It is obvious that our skin is a complex organ that protects us from many environmental influences, chemicals, pathogens and/or sun exposure. Little thought goes into the function of the skin and even less thought goes into what our skin is absorbing. A study done in 2009 reported that silver nanoparticles absorption through intact and damaged skin was very low but detectable. Silver nanoparticles could be detected in the stratum corneum by electron microscopy. That all said, whatever you put on your skin will be absorbed sooner or later by your body through the blood vessels in your skin. In making your own body products and by using organic ingredients, you can be sure that whatever you put on your skin is safe and nourishing so that you have a functioning organ for a very long time. (3) Toxicology: Human skin penetration of silver nanoparticles through intact and damaged skin.